On a warm September morning at the San Diego Zoo, Mei Sheng, a frisky 2-year-old daredevil of a giant panda, dangles upside down from a wooden jungle gym. Within seconds, he rockets to the top of an enormous elm tree and scrambles to the edge of a branch-which heaves dangerously under his weight. Just when it appears that he'll be pitched headlong into the throng of visitors below, a volunteer coaxes the creature down. Giant pandas have been drawing crowds since the first panda cub, Su-Lin, was brought to the U.S. by the socialite and adventurer Ruth Harkness in 1936. Communist China's first gift of a panda pair, Ling-Ling and Hsing-Hsing, to the National Zoo in Washington, D.C., in 1972 only fueled the desire for a close-up look at these popular animals. been destroyed. Today, wild pandas are confined to six mountain ranges in southwestern China. In captivity, attempts to breed giant pandas largely failed. Females in U.S. zoos often seemed unable to conceive. The fragile cubs that were born rarely survived. Now, for the first time ever, we have two happy, strapping cubs at once-one at the National Zoo, the other in San Diego. And in the wild, a census released last year indicates that there is better news than anyone dreamed: There are nearly 1,600 pandas in the mountains of China- 40% more than previously were thought to exist. How the panda escaped extinction. Helping these enigmatic bears both in the wild and in captivity has not been easy. Donald Lindburg, head of giant panda conservation at the San Diego Zoo, says they present "a challenge unequaled by any other species." They are carnivores who eat mainly bamboo. They are elusive animals who sport bright coloring. And they are slow reproducers who mate just fine in the wild but are turned off by the conditions of captivity. "When we started working with the Chinese, there were just 104 giant pandas in captivity worldwide," says David Wildt, the head of reproductive sciences at the National Zoo. "There were some successes with artificial insemination," says Barbara Durrant of the San Diego Zoo, but they were often a matter of luck. Almost a decade ago, Washington and San Diego under took an ambitious plan with their Chinese colleagues. The goal was not only to gain data about pandas but also, as Wildt says, "to convert that scholarly information into new babies." That commirment has paid off. The best proof of the galloping advances in science has been the births of cubs, raising the number of captive giant pandas to 185. Much of the success can be credited to researchers who recently have begun to unravel a number of biological and behavioral paradoxes. One breakthrough came in discovering the way panda babies are nurtured. Panda mothers have twins nearly 50% of the time. In the wild, the mother focuses on one baby, leaving the other to die. But in captivity, experts have perfected a technique in which the twins are rotated between the mother and a nursery, allowing both babies to thrive. Another advance came when researchers began to gain a better understanding of the panda mating system. "People always say these animals are such poor breeders," says Carter Roberts, president and CEO of the World Wildlife Fund, a conservation organization. "But in the wild. there are very randy pandas." Male pandas are able to pinpoint with sharp accuracy the moments of greatest female fertility. Unfortunately, Barbara Durrant concedes, "all our current chemical analyses are not as good as a panda nose." Nevertheless, we're learning how to coax nature along. 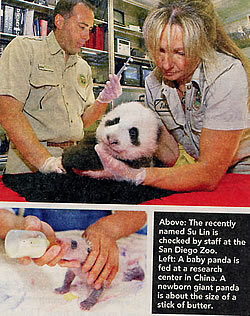 Durrant, in fact, performed the artificial insemination of the panda Bai Yun in 1999 in San Diego, which resulted in the birth of the female Hua Mei. She is the first panda ever born in this country to survive to adulthood. More recently, with Durrant's help, Bai Yun and the male Gao Gao became the parents of Mei Sheng and, in August, the cub Su Lin (named after the first baby panda ever seen in the West). Today, Durrant flies around the globe with her insemination kit to help captive pandas in China, Japan, Mexico and other U.S. zoos. Boosting captive numbers helps to pad an insurance policy against extinction. "The captive population is so valuable because the wild one is so vulnerable," David Wildt says. Computer models suggest that when 300 pandas are living in captivity, it would be safe to reintroduce them to their natural habitats. Not out of the woods yet. But there is another challenge to be met: Preserving enough undisturbed forest to which pandas can return. According to the WWF, the picture is looking brighter. Currently, the group provides money and expertise to the Chinese government to protect the bears. Carter Roberts says efforts to preserve their habitats have increased significantly in the last few years. Fifteen years ago, there were just 13 panda reserves. As Beijing has grown more aware of the global desire to see pandas survive, the figure has shot to 60. At the same time, however, China's mushrooming population exacerbates the ongoing tension between human and animal habitats. So, even as scientists work diligently on panda biology, citizens and governments must try to preserve, enlarge and link those wild places. Today, each zoo in the U.S. exhibiting a panda pair pays the Chinese government about $1 million a year earmarked for panda conservation. And as we zoogoers flock to special exhibits to catch a glimpse of pandas at play, we are helping to ensure their future. While they are not secure yet, our commitment to these creatures may be the secret to their long-term survival. "People will protect what they care about" says San Diego's Don Lindburg. "And we care about what we know." Adds Carter Roberts: "Our goal is a world for our children and grandchildren in which there's room for wild pandas. We'll need to work hard to achieve it, but we're optimistic." Vicki Constantine Croke is the author of "The Lady and the Panda: The True Adventures of the First American Explorer To Br ing Back China's Most Exotic Animal" (Random House, 2005). Become a panda parent. Several zoos and conservation groups accept financial contributions through "adopt a panda" programs. By symbolically adopting a panda at Washington's National Zoo (www.nationalzoo.org), for example, you can help pay for its care as well as conservation efforts in China. When you donate through the World Wildlife Fund's Panda Adoption program (www.worldwildlife .org), you'll receive a Personalized Adoption Certificate and a computer-desktop image of your adopted panda. All of the funds raised go to saving the pandas through innovative practices, such as providing biogas stoves-which bum manure instead of wood-to villages near panda forests. Got bamboo? Giant pandas have giant appetites and can dine on bamboo up to 16 hours a day. Zoo Atlanta (www.zooatianta.org) and the Memphis Zoo (www.memphiszoo.org) accept donations of bamboo from private landowners. 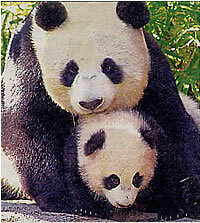 Hua Mei is cuddled by her mom, Bai Yun. The cub was conceived through artificial insemination at the San Diego Zoo. Get to know the pandas! By visiting pandas in U.S. zoos, you are helping to ensure their survival. If you can't see the young pandas in person, be sure to check out the Panda Cam at the San Diego Zoo's site (www.sandiegozoo.org) on the Web.